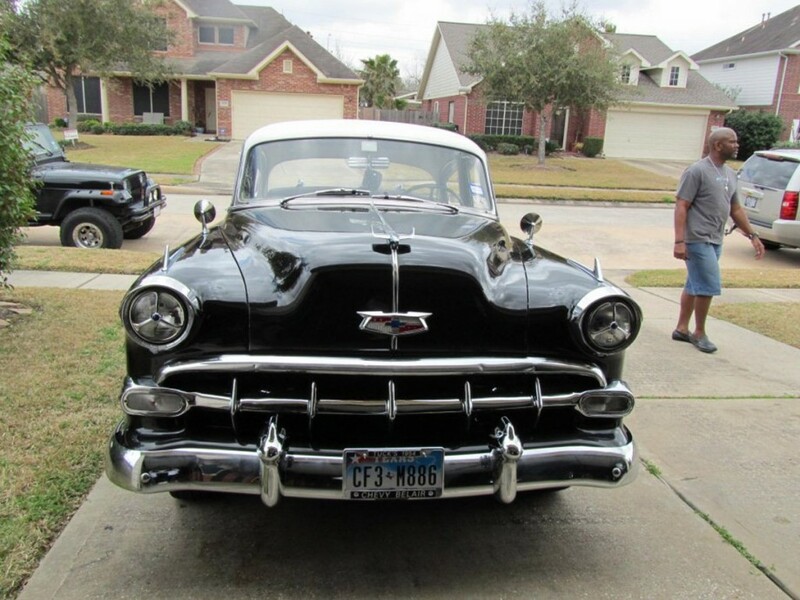 Owning a 1954 Chevrolet Bel Air was never high on Texan Gregory Tennessee’s wish list. His father-in-law, Jacob Richardson, however, purchased a used Bel Air a couple of decades ago and drove it to his home in Silver Creek, Ga. In the early 1950s, Chevrolet built hundreds of thousands sound, reliable cars, all of them powered by the famous six-cylinder engine. The engine was virtually indestructible, but performance was not very exciting. Richardson died in August 2009. Tennessee and his wife, Sondra, were visiting her widowed mother the last week of December 2009. Tennessee thought that keeping his father-in-law’s old Chevrolet in the family would be a good thing to do in honor of Richardson’s memory. Soon after returning to their home in Texas, Tennessee borrowed a trailer, hooked it onto his SUV and drove the 15 hours back to Georgia to retrieve his late father-in-law’s Chevrolet. After making the 15-hour return trip to Texas he did not take the car to his home. 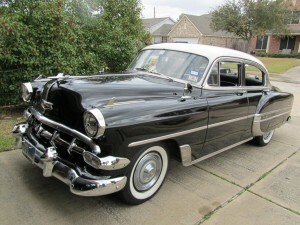 Instead, the old Chevrolet was delivered to a restoration shop. Tennessee reports that to be on the safe side the 235.5-cubic-inch, inline engine was removed, as was the three-speed manual transmission. He says both were rebuilt to original specifications. With a manual transmission the engine was set up to deliver 115 horsepower. The few spots of rust along the lower parts of the Chevrolet were removed and replaced with healthy new steel. When the time for repainting arrived Tennessee opted for a pearl-over-black combination to replace the original teal color. Tennessee located new bumpers and had the original bumper guards replated with chrome. Since all of the stainless steel trim was removed while the painting was being done, Tennessee took the opportunity to polish the shine back on the trim. He says it was a two-day project cleaning and polishing with baking soda and SOS pads. When every trim part was sparkling he sprayed each one with a clear coat finish. 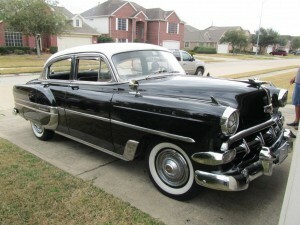 The top-of-the-line four-door Bel Air model was the best-selling Chevrolet in 1954 with a total of 248,750 sold. Each of the 3,255-pound cars had a base price of $1,884. This particular Chevrolet came equipped with an AM radio, heater, turn signals, backup lights and rear fender skirts. Whenever Tennessee enters the reupholstered cabin he settles behind the shoulder-wide two-spoke steering wheel where he can see the 110-mph speedometer. “It will probably do 75 downhill with a tail wind,” he says. A set of 6.70×15-inch tires on a 115-inch wheelbase provides a comfortable ride. According to the owner, all of the glass is original and the one-piece windshield is kept clear by a pair of vacuum wipers. The anemic performance of the vacuum operated wipers is of no concern to Tennessee because he never plans to have the Bel Air out in rainy weather.